OK, Mr. Speaker, the Ball’s in Your Court. That might be the case if Bruce Rauner was the governor of Chicago, but he’s the governor of Illinois, with other constituencies to consider. The Block Grant that SB 1 placed in CPS’ Base Funding Minimum is removed, thus allowing this $202 million to go through the new “Evidence-Based” funding formula to be distributed to school districts across the state. Removes $221.3 million for CPS pension normal cost and retiree healthcare from its Base Funding Minimum (hold harmless), and instead amends the Pension Code to provide a continuing appropriation for CPS normal and retiree healthcare costs. Therefore, CPS would still receive funding for its normal pension costs, but through the Pension Code and not a school funding formula, just like every other district in the state. Removes CPS’ ability to reduce its local revenue target by its self-imposed unfunded pension liability (“legacy cost”) which would result in even more state aid to CPS. Under SB 1, CPS’ available local revenue is artificially reduced by its legacy cost liability of $505 million, providing $40 million more in state aid to CPS. Due to the annual growth of CPS’ unfunded pension liability, this number would have grown substantially in future years. Where the Commission unanimously recommended a per-pupil hold harmless, SB 1 fixed a per-district hold harmless in perpetuity. By freezing all districts’ base funding at an arbitrary moment in time, it limited the state’s ability to reflect fluctuations in enrollment and better target available money to students in need. SB 1 includes a regionalization factor but places an artificial floor on it, driving up costs and exacerbating our state’s already-significant distance from adequacy. SB 1 also established an unsustainable minimum funding level that, if not met, would trigger a shift of all new state resources to Tier I districts at the expense of Tier II districts. All in all, while the bill as amended doesn’t go far enough to provide for substantive property tax relief, it’s a vast improvement over SB 1, and I’m firmly in the camp which will vote to uphold the governor’s veto. Now let’s see if the Senate and the Speaker will let us do that. This entry was posted in Education, Illinois Budget, Property Taxes, Public Pensions and tagged Amendatory Veto, Chicago Public Schools, Public Pensions, Sentate Bill 1. Bookmark the permalink. One Response to OK, Mr. Speaker, the Ball’s in Your Court. Chicago has chosen not to levy property taxes beyond the means of its community. 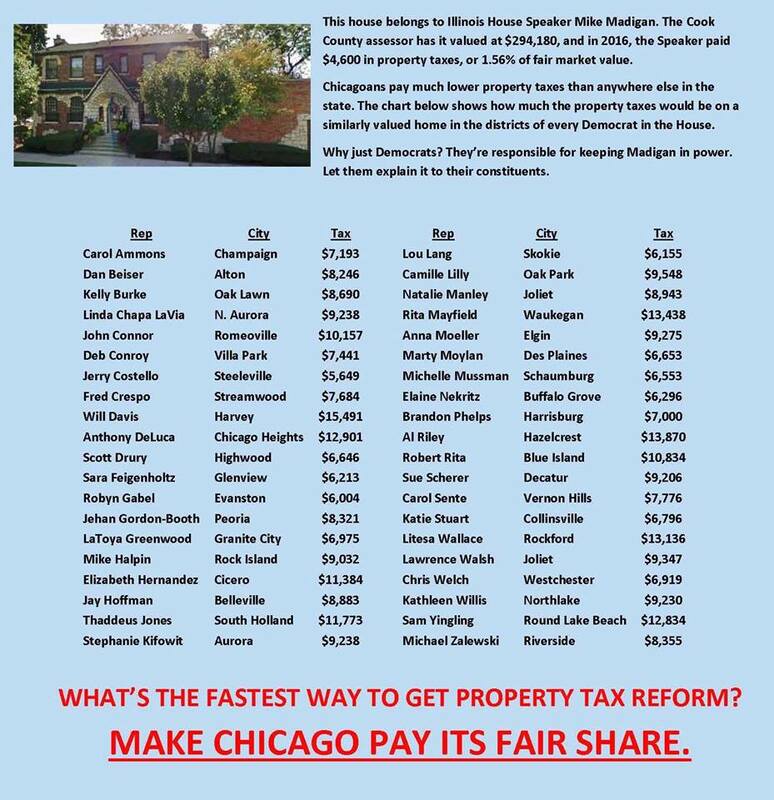 Property tax rates in Chicago are below 2.5% of fair market home value. Woodstock Il has chosen to levy property taxes beyond the means of its community. Property tax rates in Woodstock IL are above 4% of fair market home value. Property VALUES in Chicago Il have recovered pre-recession values, and new high-end development is occurring. Property values in Woodstock Il are about equal to property values 20 years ago, and no development (other than subsidized low income housing) has occurred since the recession. Chicago COULD levy the money they want as a property tax, but understand that so doing and crashing real estate values brings worse troubles, as evidenced by Woodstock history.